← So Live A Little! There’s more than one way to have a wine-making business, as you can imagine. There are a lot of wines out there made by consolidators far from where the grapes in those wines are grown. Some consolidators will even buy already-made wine from a number of producers, then blend, bottle, and label it themselves. We’ve probably all bought wine like this at one time or another, and not necessarily regretted it. For example, in France, E. Guigal has a reputation for very good quality wines, even though they don’t grow the grapes themselves. But at First Vine, all of the wines we sell are made close to, if not on, the property where the grapes are grown – both from independent producers and grower-owned cooperatives. Many people’s mental images of winemakers look much like the movie “The Good Year” with Russell Crowe. (Maybe not, since very few people saw the movie – with good reason — but I had to start this post somehow!) Rugged individualist, gruff yet wise, farmer, winemaker, magician, student of nature and chemistry, passionate salesman… you get the picture. All kidding aside, successful independent winemakers have some or all of these qualities, and we’re proud to buy wine from several of them. Still, it’s not for everyone. There are a lot of people in the business who don’t want or can’t afford to do it all themselves. 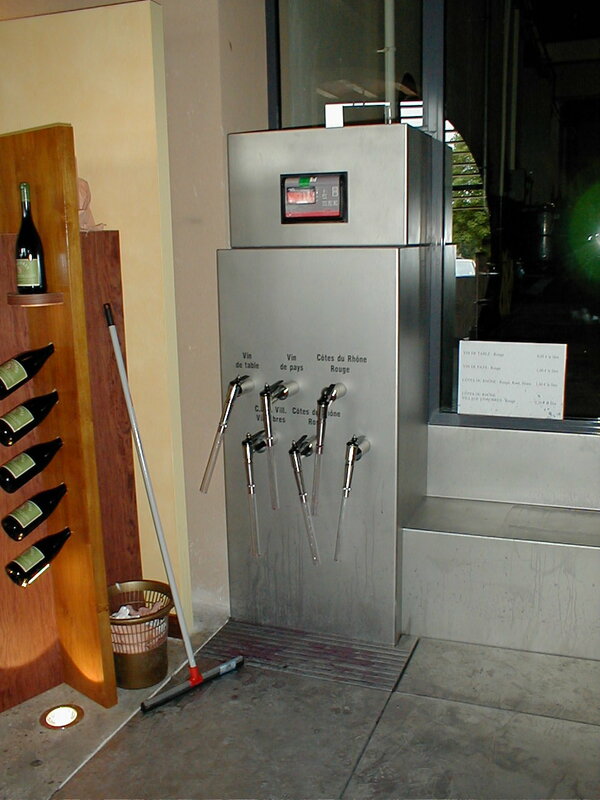 Winemaking equipment is expensive, and you have to have enough land to make enough wine to make it worthwhile. Wine regulations and the quality of the grapes are other factors – some growers in regions or villages known for higher-quality or more prestigious wines choose to make their own because they can sell it for enough money to make small production worthwhile. The math becomes more difficult for less prestigious areas, where the wine price is lower. There are options for growers who don’t make wine in-house from their grapes. They can sell their grapes to other winemakers or on the open market, as I mentioned above. Alternatively, many growers, especially in France, turn to cooperative wineries as a way to grow grapes and make wine. Cooperative wineries (or co-ops) are almost always owned by the growers, who have a stake in the management and products made. 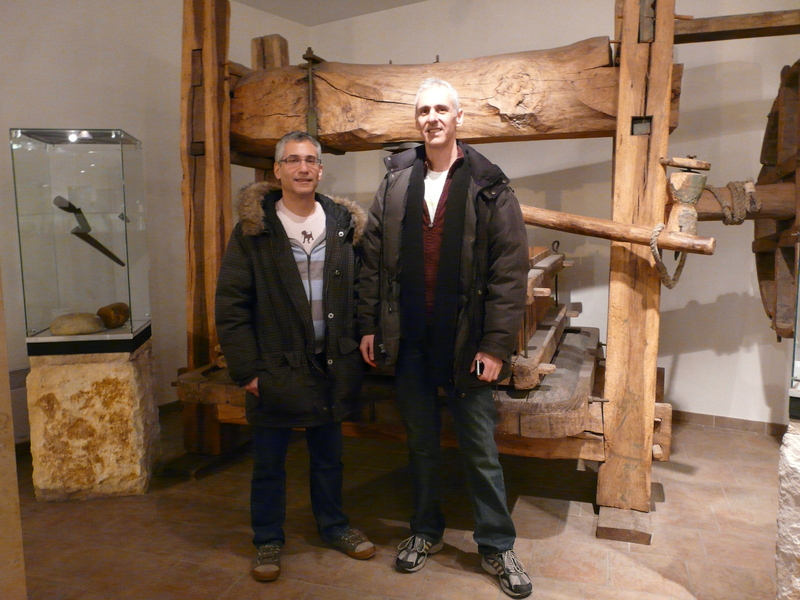 Tom and Cy pose in front of an old wine press on display at Covama. There are two different kinds of co-ops. The first is an organization in which growers share equipment and staff but still make their own wines. The growers may also sell some of their grapes to the cooperative to make a house wine. The co-op can provide growers assistance with sales and marketing, but they’re generally the growers’ responsibility. First Vine’s champagne producer, Bernard Mante, is a member of this kind of co-op. Covama, the Société Coopérative Vinicole de la Vallée de la Marne, where Bernard makes and stores his champagne, is home to several champagne producers. Cy and I visited Covama last January, and it’s fascinating to see the traditional hand-work of making champagne done on a large scale with some automation. Yet each producer uses his grapes and recipes for his products. (Interestingly, Covama’s house champagne, Champagne Pannier, is sold in the U.S., and we found it in a local wine shop not long ago). Unfortunately, it has become fashionable to denigrate this type of co-op as a supermarket, where the people selling wine have no connection to the land it came from. But that’s unfair – in all likelihood the person manning the register at a village co-op is related to half a dozen of the co-op’s growers and can tell you anything you’d like to know about the wines. You probably won’t get to meet those rugged individualists in person, but you’ll most certainly drink well. First Vine imports wine from four co-ops that operate this way: Cave la Vinsobraise in Vinsobres, Cave la Vigneronne in Villedieu, Cave la Romaine in Vaison la Romaine, all in the Southern Rhône Valley, and Les Vignerons de Tutiac in Bordeaux. Needless to say, I think they’re fabulous. And if you visit any of them, or try their wines, I bet you’ll think so too. One of the great things about co-ops, like Cave la Vinsobraise, is that you can bring your own container and fill it up. Since it seems like summer already, I’m recommending Cave la Romaine’s Côtes du Ventoux Rosé ($10) from the co-op in Vaison la Romaine for this week’s wine. It’s made from Grenache and Syrah, like many of the region’s red wines, lightly pressed and left on the skins just long enough to give it a healthy pink color. It’s dry, but like all good rosés, it picks up the sweetness in foods you serve it with, especially seafood. I like it with crab cakes, which I think are the ne plus ultra of seafood-dom. Crab has a pretty subtle flavor, and while it’s tempting to add all sorts of things to crab cakes, simpler is better for me. I like a little bit of onion and red bell pepper, cooked just enough to soften but not brown them. There are two major points of contention among crab cake makers once you get past the claw meat vs. backfin thing (most of us don’t have a choice in that anyway): eggs vs. mayo and flour vs. breadcrumbs. I come down on the side of eggs with a little mustard as a binder, but that’s because most commercial mayo tastes a little bit sweet. If you make your own, or have one that’s absolutely not sweet, you can use 3 tablespoons of mayo plus a half-teaspoon of mustard (preferably Dijon) in place of the egg and mustard. As to flour vs. breadcrumbs, I like flour inside and breadcrumbs outside, just a little of each. Because there’s not much holding these crab cakes together, you need to chill the cakes before you press a little breadcrumbs on the outside and then fry them. I guarantee you it’s worth the time, and that gives you a chance to drink more wine in the meantime anyway. Melt the butter in a medium-sized non-stick skillet, and sauté the onion and pepper for a few minutes, just to soften them without browning. Transfer them to a bowl and let them cool for a few minutes. To that bowl add the crab, egg/mustard mixture, flour, some pepper and about a half-teaspoon of salt and then stir everything together gently until it’s just combined. Shape the mixture into four crab cakes, and make them flatter rather than rounder. Put the cakes on a plate, cover with plastic wrap, and refrigerate for about an hour. Heat some oil in the same skillet in which you cooked the vegetables. Scatter about a tablespoon of the breadcrumbs on a small plate and gently press one side of a crab cake into the crumbs. Then remove the cake, rearrange the remaining crumbs, and press them onto the other side. Repeat for the remaining crabcakes. Fry the cakes until the bottom is browned, about 6 minutes or so. Then gently flip them over and fry the other side. Serve hot. This entry was posted in Cave la Romaine, Cave la Vinsobraise, Champagne Bernard Mante, Cooperative wineries, Covama, Crab Cakes, french wine, Les Vignerons de Tutiac, Musings/Lectures/Rants, recipes, Tom Natan, Villedieu, wine delivery washington dc. Bookmark the permalink.